Every poet needs a place to write and talk the mystery and craft of poetry. and blood; contemporary, all cutting edge. None were made from a false scaffold. Each spine listened in the morning light. No page played the know it all. The plots meandered the way I like. Someone sat at a prairie sickbed. remain this year's best of best. All my poems and poetry projects grow out of collaboration. My first book of poems, was a collection of companion poems written with the poet, Judith Tate O'Brien. We threw out seed words to each other each Monday when we met to write together. At first, we simply considered these practice poems. Eventually, some of them became a shared chapbook. This kind of collaboration is intentional, ritualized, and requires the push and pull of two different voices and styles. There is another kind of creative activity I call accidental collaboration. Some image or story falls into my secret pencil case and starts to write itself. This has happened a lot over the years with my grandchildren. They are just walking seeds for creativity. Sometimes their sparks are so bright there is no poem that can contain it. That's fine. There are written poems and lived poems. We all know that. The accidental collaboration can happen anywhere, even on the often banal landscape of social media. A few months ago I was captured by the beauty of a friend's photograph of a slice of moon which appeared to be balanced on a wire making our common neighborhood street appear magical and mysterious. I thought: what's going on up there? I wrote the following poem and post it here with the image and permission of Mary Catherine Reynolds, my accidental collaborator. like an Oklahoma neon light. brave, smiling at the open door? a tiny joint up there on Western Ave.
to tunes we used to know. What was I thinking titling my poetry class Ekphrastic? Obscure. From the Greek. It drew five participants, but one dropped out after being told it was not, as he thought, a class on the geology of the southwest. It was poetry based on art. So, I had an amazing class of four. The thing I love about a tiny group is that we can meet in the intimacy of Ghost House, the first adobe structure build on the property in 1888. 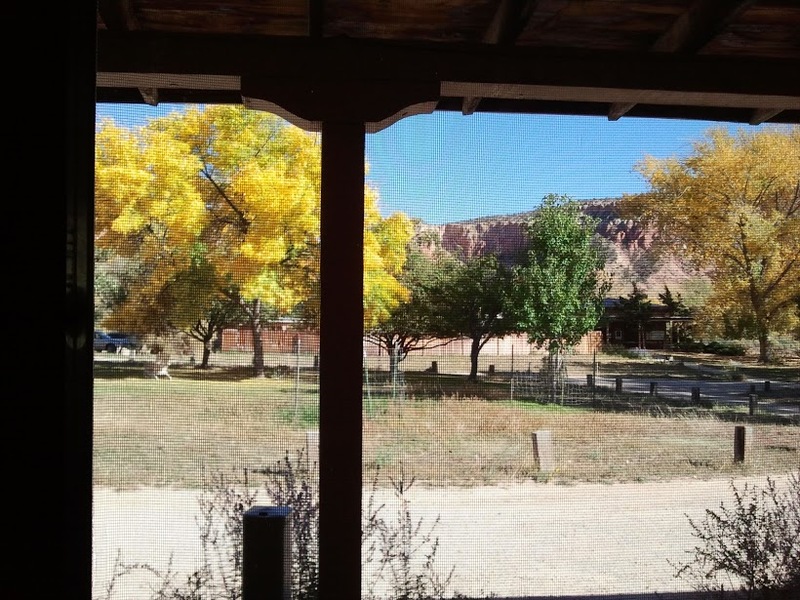 Through the double cranked out windows we can see the old rustler cottonwood, the “hanging tree” turning golden. Farther out, the mesa which is surely about to wear out its ancient name: Pedernal. The other thing I love is that with four writers, five with me, there’s room to notice all the other invisible spirits who want to hang around and have their say: living and passed -- a wife, a son, a dog almost lost to depredation. We welcomed in van Gogh, an artist named Veeneman, songster Donald Fagen, O’Keeffe, of course, and a farm in Namibia called Damara. The room fills up with newness. The daily grind we left behind recedes. Language powers us up beyond the tiring talking points lodged in our heads from dogged media. These writers were so creative in that space I almost decided against a field trip to a gallery in Los Ojos. But the day was ashine with Aspen and Chimisa, so we went. One the way, a flock of Churro sheep slowed us down. The border collies and horse-mounted shepherds minded hundreds of woolen ungulates waving down and up, down and up, Highway 84. Other drivers turned around. We took turns jumping out the truck to get a closer look. That day in Rio Arriba County something was happening and we were there to see it, smell, and feel it -- the October ritual of guiding sheep down out of their summer highlands. When the flock turned left and quilted down toward the valley, we were suddenly less interested in a gallery. Anyway, it was closed. Tierra Wools was open, though, and we went in and marveled at the brilliant hues of wool, the looms. We loved the women with their needles clicking, talking, laughing, by the fire as though it was an ordinary autumn day. Nothing during the week was very ordinary, especially the poems, a few of which I am happy to share with the wider world. With permission, here is a sampling. Artist brushes in hand and paint. Until the crowd of cloud-hued sheep was gone. A shop, where crafty weavers worked their magic. From skeins of yarn a colour wheel unspooled. It’s done. Now all that wool’s for walking on. are we a part of it? How to coax a poem out of hiding was the general theme of last week’s poetry interactive at Artspace At Untitled. I was joined by Ben Myers (Oklahoma Poet Laureate) and Chad Reynolds (of Short Order Poems and Penny Candy Press) in talking about methods and meanings of our own practice of poetry. Special thanks to the writers and artists who came out to listen and who wrote fascinating pieces of their own right on the spot! To add to the fun of the evening, our favorite influences showed up in spirit as we traded tips and threw out prompts. It seemed as though William Wordsworth, Ted Berrigan, Richard Hugo, Bernadette Mayer, and even, for a moment, Doctor Who showed up. I was reminded of my first poetry teacher, Betty Shipley, who often focused on gathering language, and continually wrote the code “ww” on my paper. Wrong Word. She was such a believer in finding the just-right-word. She was a proponent of the scavenger hunt. Just go look on page 52 of Brewer’s Dictionary of Phrase and Fable, Betty would say. She played the sheriff and the seer and other funny juxtaposed authorities. So, in this spirit of play and happy exchange, I’m inviting you before time runs out (Sept 22) to come downtown (1NE3 street) and participate in A Hiding Place. As Betty would say, there is something in that gallery you need to know. Just be open to it and let color, shape, contrast, language, texture, sound, story, movement, talk to you like an old teacher. And for your scavenge pleasure, here are 8 evocative lines from the participating poet which you can look for on the finely letterpressed poems mounted on the wall. Before you leave, please thank the Gallery geniuses, Rebecca Bloodworth and owner, Laura Warriner, for bringing us all together in this way. Then make something. You know you want to. This exhibit at Oklahoma City's beautiful gallery, Artspace at Untitled, will be up until mid September. We, eight poets, wrote poems with a hiding place in mind. Each poem was offered to a cluster of artists who used the themes and images to create a unique work of art. I would love to hear what you find most compelling about this collaboration. Please send me your comments after you tour the show. Today I’m thinking back to A., writer-in-residence in the 1990s. I enrolled in his class in poetic forms. Each Monday night we brought forth a freshly manufactured sonnet, villanelle, or triolet. The best part of a class with A. was his odd and clumsy entry, his abrupt recitation of a favorite poem. Didn’t he love the Irish and the Welsh – Yeats and Dylan Thomas? He was pretty keen on Roethke. He knew that Lawrence poem about the snake by heart. But he was not in love with us, his needy budding poets. Early on, he told us he’d moved beyond poetry. Mr. A. was working on a novel about gambling and the people who can’t live without it. Nevertheless, it was in his contract to teach one poetry class, thus these traditional forms, scansion, training the ear to the foot -- iambic, trochaic, spondaic. Reciprocally, there was not much to love about Mr. A. When I saw him running in his sweats around the campus sidewalks in the snow he looked like Rocky played by Steve Buscemi. Like he’d lost something, he was trudging along eye on the old clock tower in case that slipped-away-thing reappeared on the hour, or off the hour. At the single one-on-one conference he allowed, A. scoffed at my attempt to write a ghazel. Leave the Persian forms to the Persians or to the wise old Bly, I thought, or he said, or I’m thinking now. Eye contact did not come easy to this visiting writer, but I asked him in an intimate voice, “Why, really, did you scrap poetry?” “It got too easy”, he said, puffing himself up slightly. “I could write a poem at the drop of a hat.” Or, I thought, at the roll of the dice or the spin of a wheel, with the speed of a horse. Bingo, he could apparently make a poem fit into the squares of a card of random numbers. Amazing. Later he told the class that he wanted to write a money-making novel. I saw it some years ago on a remainder table in The Strand. There certainly was no book of mine there on any table, sale or otherwise. So never mind a pay-back silly scoffing. I must have learned from Professor A.: how form works and doesn’t work, what one cannot live without, what to love enough to know by heart. My other teacher, Time, taught me not to cheat or bluff or dope the thing. For most of us, the novice or the longtime practiced, making a poem get out the gate then cross the finish line with just the right amount of sweat, no more, no less, is hardly ever easy. And the rewards are hard to calculate. You just walk back up to the window and put your earnings on a another horse that strikes your fancy. Last week the poet, Sandra Soli, tagged me on Facebook, challenging me to write five poems a day for five days, or something like that. Though I had been enjoying this project’s posted poems, I was not entirely “knowed up,” as the folks in western Oklahoma like to say. More to the point I wasn’t “geared up.” Gosh, no! was my first thought. 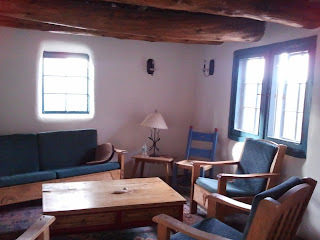 My second thought and best excuse was that I was late getting my syllabus into Ghost Ranch for the Fall Writers’ Festival course: Writing Rituals. Oh, wait: practice a writing ritual, or think up potential writing rituals for others to try out? One the fourth day I returned to my summer 2015 obsession : the non-rattler, but no less frightening snake that tried to stare me down at dusk one night. I was going to trap it. I was going to have it caught and killed. I feared it was under my bed at night or hidden in the ironing basket after coming through some leaky pipe of plumbing. Apologies to all of you who listened to me illogically rant reptilian. I’m over it now. Now I look for it in my overgrown yard. I state conditions: don’t sneak up on me, don’t cross the back porch threshold. A minute videoing snake habitat while safe behind my pointed camera has cured me of this irrational fear. Plus, now I have a silly snake poem called HISS. Here he is again in slithery daylight, rounding my door. I would never be tempted to follow him out of the garden. Snakes are potent, kingly with diamonds, sneaky. Some drop them into poems like charms. Sans hysteria, my neighbor says get a gun, get a hoe. sand my porch again with Snake Shake . Satan, I say, don’t trick me into sin, venial though it be. Here is it day five. Today’s minute-made movie is called, Preparing to Work, or Watch Out, You Might Get What You’re After which is really pretty boring because it's just me heading for my workspace to write while listening to Talking Heads. I think video art is not my forte, but the week was full of play and close looking. Hooray, I have drafts to work with. My notebook is happy. Thank you, Sandra Soli, and all you hard working poets who inspire me. I am a poet who loves both intense solitude and vigorous collaboration with other artists and writers. I teach creative writing at Ghost Ranch in New Mexico every chance I get, but live happily and write daily in Oklahoma City.